Whether you’re flying sunrise, sunset or anywhere in between, this Fort Wayne helicopter ride guarantees A+ views and wonderful memories. 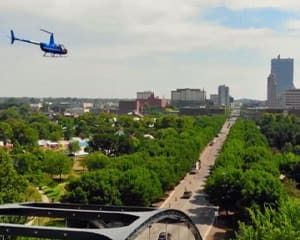 This helicopter flight soars high above Fort Wayne’s many architectural and natural gems. See the St. Marys, the St. Joseph and the Maumee Rivers from high up in the clouds, capture photos of new riverfront developments, explore the downtown core—with 30 minutes of sky time, you’ll get to see it all! A third passenger flies for free! Book for two and bring along a third friend or family member! Everyone on the adventure gets a window seat and because its a private flight, one lucky passenger even gets to sit next to the pilot! Take a 30-minute Fort Wayne helicopter flight! Travel from Smith Field Airport to Coliseum Blvd. Get amazing views of the downtown skyline. See Leo Crossing and Huntertown. Look past the horizon to Jefferson Point and George Town! Travel high above For Wayne’s Three Rivers. Capture striking photos of the new riverfront developments. Appreciate totally unobstructed views through the Robinson’s wide windows. Whether you’re flying sunrise, sunset or anywhere in between, this Fort Wayne helicopter flight guarantees A+ views and wonderful memories. Book today!